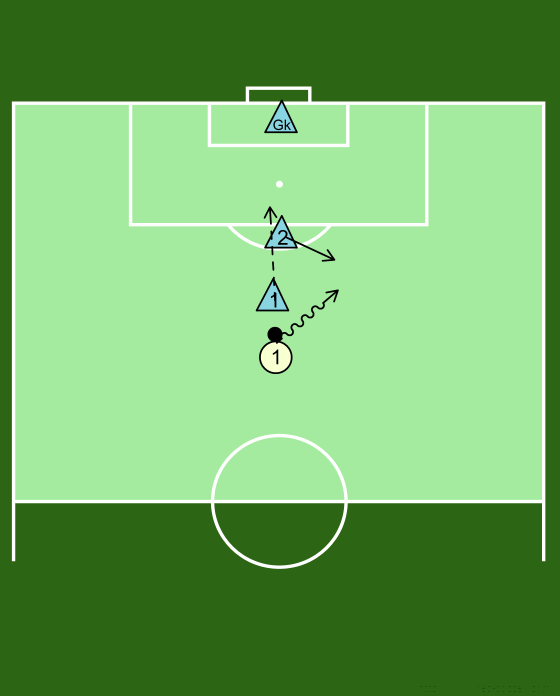 Aim of the game is for attacking player 1 to beat the two defenders and score. The two defenders have to make sure that the forward is squeezed away from a clear shot. As player 1 comes forward, he is closed down by defender 1. Defender 2 drops 5 yards behind Defender 1 as extra cover. As Player 1 beats defender 1, defender 2 then closes down the attacker and defender 1 drops 5yds behind him as extra cover. The process is continually repeated with defenders interchanging positions ONLY after they are beaten by the attacker. With regular practice, the defenders should be able to naturally follow this defensive pattern and eventually force the attacker to the wider defenders.